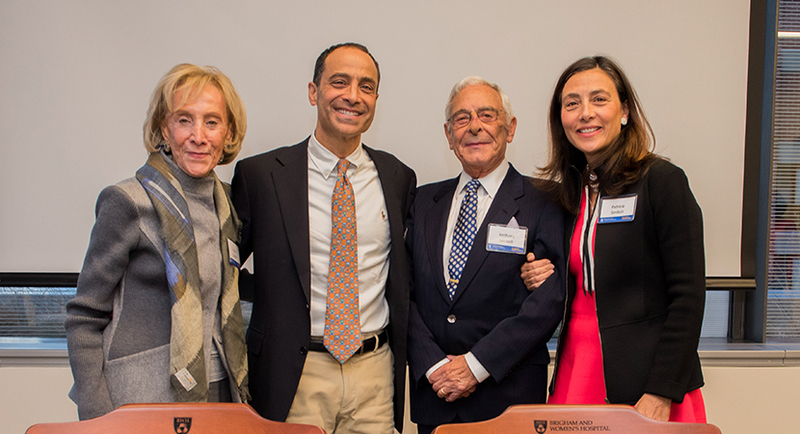 To celebrate the Gloria M. and Anthony C. Simboli Distinguished Chair in Asthma Research, more than 50 of the Simbolis’ family and friends, with members of the Brigham and Women’s Hospital community, gathered in the Building for Transformative Medicine on November 1. The Simboli family’s generosity established the chair to honor inaugural incumbent Elliot Israel, MD, the director of the Asthma Research Center. Israel plans to use the chair’s endowment to strengthen faculty training opportunities and expand research into the causes of asthma and new treatments for asthma patients. Paul Anderson, MD, MPH, chief academic officer, senior vice president of research, and host of the celebration, lauded the Simbolis for their dedication to patients and families affected by asthma. Read more about the Simboli family’s extraordinary commitment to asthma research below.